From the award-winning producer of A DREAM IN HANOI and BOYS WILL BE MEN comes this 30-minute documentary about how 12 ordinary people, from very different backgrounds, came to accomplish extraordinary deeds; deeds which changed the face of the nation. Together with tens of thousands of other Americans, they joined the Civil Rights movement to protest racial inequality, segregation, and discrimination in the 1960s. THE LONG WALK TO FREEDOM demonstrates to today's young people that the struggle for civil rights, justice, and equality is indeed a "long walk" - an ongoing challenge requiring the participation of successive generations. And it illustrates how ordinary individuals can become involved in social change. "Mining a rich vein of the past, The Long Walk... reflects the history-making events of the 1960s civil rights era and the very personal journeys of the people who were an integral part of it." "The Long Walk to Freedom is a richly textured, deeply moving account of the civil rights movement that awakens viewers to the power and dignity of collective nonviolent action...a powerful antidote to alienation, cynicism and apathy, and a compelling invitation to become part of the solution...The activist's stories, supplemented with archival film footage, music, and photographic images, do more than inspire hope. 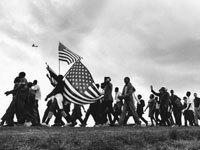 They are skillfully interwoven to create an eight-chapter chronological history of the civil rights movement...As a package, The Long Walk to Freedom is an invaluable resource for teachers who wish to inspire civic involvement, critical thinking, values clarification, and active engagement with the past. The collection, while designed for high school students, can be adapted to younger and older audiences, and used in a wide variety of courses including U.S. history, African American history, social studies, U.S. government, and civics." I highly recommend the use of this resource for students, teachers, and general community members who wish to school themselves on a most important aspect of US History -- and on ordinary people who did extraordinary things that continue to shape our lives today and in the future." "[The Long Walk to Freedom] serves up a respectable primer, enhanced with vivid specifics on the voting-rights marches and the uphill battle of hardships faced by the thousands that this film's dozen speakers represent, as familiar stock footage is mixed with moving black-and-white photographs...Recommended"
"Highly Recommended. The Long Walk to Freedom is an excellent presentation and overview of the civil rights movement that should be part of high school curriculum libraries and academic libraries with teacher education programs. It may also find a home in libraries with large African American history and oral history collections." "Overall this is a high quality purchase for schools needing additional resources in this area." "Outstanding... [The Long Walk to Freedom] will be welcome in academic and school libraries." The DVD contains the following special features: * 120 pages of text and photographs that describe 16 key events in the history of the Civil Rights Movement * Brief video autobiographies of the 12 civil rights activists featured in the documentary * A comprehensive 43-page Teacher's Guide, in Adobe Acrobat PDF format for easy viewing, on the DVD-ROM portion of this disc. The guide is organized by the chapters in the documentary. For each chapter there are the following: section on teacher preparation, with suggestions for reviewing the DVD; list of relevant materials and resources; discussion questions; classroom activity; homework/critical thinking activity; ESL activity; quiz.